Sunshine Service Brake & Alignment performs an evaluation of your vehicle when it is in our care, which becomes part of your vehicle’s service record. We test drive your vehicle before work on your vehicle and before we return it to you. Each technician creates a thorough evaluation, signs and dates their work, and enters the data into our system so that we can track your vehicle’s service history by age and miles driven. Sunshine Service Brake & Alignment is a Certified NAPA Car Care Repair Center, we install quality NAPA Auto Parts and Lubricants. It is important that we install quality parts, as we agree to stand behind our parts and labor for a full three-years. We offer a full three-year (in our shop) 36,000 mile warranty on all parts and labor that we perform. As a certified NAPA Auto Care Center, our repairs automatically come with NAPA’s three-year, 36,000 mile Nationwide Parts and Labor warranty. Our Sunshine Service three-year warranty is in our shop. 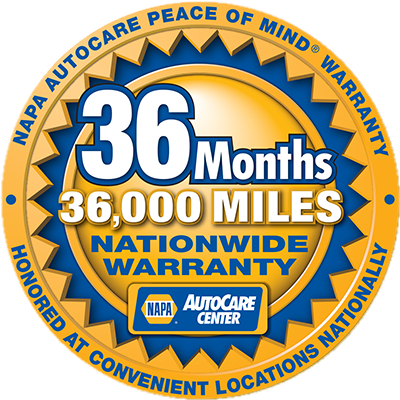 NAPA’s three-year "Worry Free" Nationwide Warranty offers the same coverage and exclusions as our warranty, with the main difference that NAPA’s coverage is covered by NAPA’s warranty administrator for the Nationwide coverage, while all warranty repairs that Sunshine Service Brake & Alignment offers, i.e. our in-shop three-year, 36,000 mile warranty, is covered by us, and you are required to bring the vehicle to us. Our warranty does not extend to off-road use. If you use NAPA’s EasyPay Card, you will automatically be upgraded to a 36 month, 36,000 mile Nationwide Warranty at no extra cost to you. If you don’t have a NAPA EasyPay Card, you can apply for one in our lobby, and in only minutes, it will be activated and ready to go. This warranty is made by the independent NAPA AutoCare Center who is so named on the repair order, Sunshine Service Brake & Alignment, and performed the services/repairs on your vehicle. This warranty will be honored by any NAPA AutoCare Center participating in this program, or other repairing facility authorized in the United States. This warranty is not a warranty by the National Automotive Parts Association (NAPA), its employees, stores or member companies – or the warranty program administrator, AMERAAN, INC. The AutoCare Center warrants that the above repairs and services performed at this location will be free from defects in materials and workmanship for twelve months or 12,000 miles, whichever comes first, measured from the date of the repair and the odometer reading shown on this repair order. This warranty is conditioned on the vehicle being subjected only to normal, non-commercial use and receiving reasonable and necessary maintenance during the warranty period. Warranty repair costs shall in no case exceed the costs of the original repair or service. If there is a defect in either materials or workmanship within the warranty period, the Dealer shall have the option to either perform remedial service work at no charge to you, replace the defective warranted part(s) without charge to you, or refund the entire charge for the warranted repairs, minus any previous refund. If you are less than 25 miles away from the originating repairing NAPA AutoCare “Peace of Mind” Warranty Program location, you must return your car to the NAPA AutoCare location where the warranted service was performed and present your copy of the repair order to the AutoCare Center. If you are unable to return to the NAPA AutoCare Center “Peace of Mind” Warranty Program location, then you may take your vehicle to any participating location authorized to perform such work in your area. If you are not aware of participating NAPA AutoCare location in your area, then you must call the NAPA AutoCare Warranty Center, at 1-800-452-NAPA, from 8:00 a.m. to 8:00 p.m. (Eastern Standard Time), Monday through Saturday. The Warranty Center will direct you to the nearest participating NAPA AutoCare location. If there are no such locations authorized to perform such work in your area, the Warranty Center will direct you to an authorized non-NAPA AutoCare Warranty Program Location. You must keep a copy of this repair order and present it when seeking service under this warranty. If warranty work is performed at a participating NAPA AutoCare Center, you must temporarily surrender possession of this repair order. If there is no NAPA AutoCare Center in your area, you must obtain authorization from the NAPA AutoCare Warranty Center prior to any warranty repair work by calling 1-800-452-NAPA. If the non-NAPA AutoCare Warranty Program location will not accept payment from the Warranty Center, you must pay for the warranty service and submit your original repair order to the Warranty Center for reimbursement. In all cases, the original document(s) will be returned to you as soon as practicable by the NAPA AutoCare Warranty Center. You must, of course, pay for any non-warranty service you order to be performed at the same time as the warranty service. This warranty will not apply to your repaired vehicle if it is/has been damaged by abnormal use, misuse, neglect, accident, alteration or “tampering with” (by other than the AutoCare Center or the AutoCare Center’s employees). The AutoCare Centers employees and/or agents do not have the authority to modify this warranty or to make any promises in addition to those contained in this warranty. This warranty does not in any way include incidental or consequential damages (additional expenses which you may incur as the result of faulty auto repair or service). Some states do not allow the exclusion or limitation of incidental or consequential damages, so the above limitation or exclusion may not apply to you. This warranty gives you specific rights, and you may also have other rights which vary from state to state. Any repair or component replacement requiring the removal of internally lubricated components or replacement of the drive axle/differential assembly. Automatic – any internal repair or component replacement requiring the removal of the automatic transmission or transaxle from the vehicle or disassembly of the same. Manual – any internal repair or component replacement requiring the removal of internally lubricated components or replacement of the drive axle/differential assembly. Any internal repairs or component replacement of internal components or replacement of engine assembly. Any repair materials related to auto body repair work.